Many species move on and within flowing, deformable substrates such as sand and soil. We study the locomotion of a variety of organisms in complex terrain with a focus on the interactions that occur between the animal body and its environment. A combination of biological studies with our computational and robotic modeling efforts is used to further understand these interactions and generate hypotheses about how a locomotor may exploit the forces between its body and the terrain to generate movement. Snakes can navigate nearly all terrain. 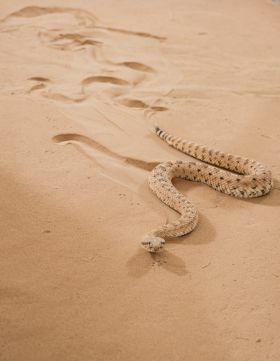 Desert-dwelling sidewinder rattlesnakes (Crotalus cerastes) operate effectively on inclined granular media (such as sand dunes) which prove challenging for limbless robots. 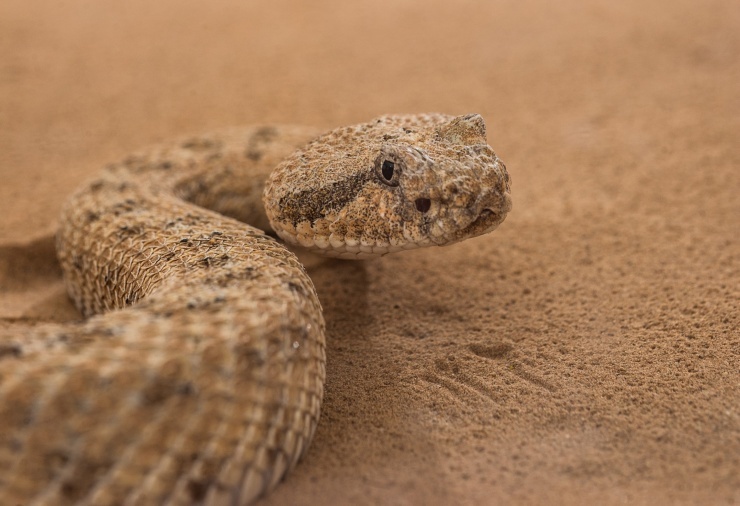 Our laboratory experiments reveal that as granular incline angle increases, sidewinder rattlesnakes increase the length of their body in contact with the sand. Implementing this strategy in a physical robot model of the snake enables the device to ascend sandy slopes close to the angle of maximum slope stability. Plate drag experiments demonstrate that granular yield stresses decrease with increasing incline angle. Together, these three approaches demonstrate how sidewinding with contact-length control mitigates failure on granular media. Sidewinding can be described as combination of a vertical and horizontal body wave, and this simple model may be the "neuromechanical template" used by snakes to control locomotion. By examining the turning behavior of snakes and testing our hypothesized mechanisms in a snake robot, we showed that snakes can execute two different types of turns, differential and reversal turns, by modulating the horizontal wave amplitude and vertical wave phase, respectively. Applying the two-wave template to the snake robot allowed not only replication of these turning behaviors, but also significant improvements in robot control. 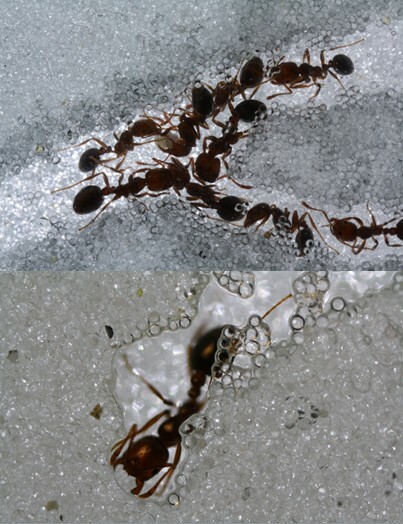 S. invicta, the red fire ant, constructs nests up to 2 meters deep with over 50 meters worth of tunnels. This species has invaded much of the Southern US, proving themselves capable of building these nests in a wide variety of soils. We use video tracking in controlled environments to study the evolution and structure of these nests as well as video tracking to study their locomotion in confined areas. Desert dwelling animals like the sandfish lizard (Scincus scincus) dive into and move within surrounding sand to escape heat and predators. X-ray imaging reveals that the animal “swims” in sand using undulation of the body, without use of limb. EMG reveals a wave of activation of back (epaxial) muscles propagating anterior to posterior during an undulation cycle. 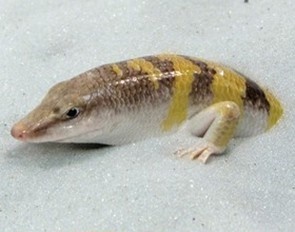 Similarly the ocellated skink (Chalcides ocellatus), which is commonly found on coastal beaches and dry desert regions, is a burrower and moves within a "tube" of it’s own creation, deforming the media around it by only a small amount. We investigate its locomotion on and within wet and dry substrates. 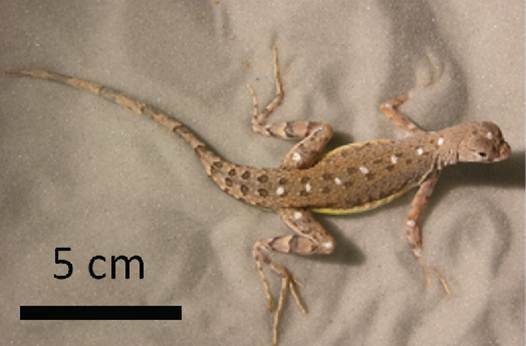 The zebra-tailed lizard (Callisaurus draconoides) is a desert generalist and runs at a few m/s on a range of substrates. The large foot behaves like an energy-saving spring on hard ground. On sand, x-ray imaging reveals that it uses the the elongate toes to penetrate and rotate in sand to generate thrust.